Firesleeve with VELCRO® Brand hook and loop closure is the perfect choice for protecting hydraulic hoses and lines, pneumatic lines, fuel & oil lines, brake lines, wires and cables from exposure to high temperature, heat, flame, fire, & pyro conditions including weld splatter, molten splash, slag and sparks. The extra thick formulation of silicone rubber dissipates hot sports quickly, preventing burn through. Also provides protection from ozone, UV and light duty abrasion. Available in two styles: HiFlex and LoFlex. HiFlex is manufactured from braided Heavy Duty Firesleeve, and LoFlex is manufactured from woven base 98oz/sq-ft fabric. The HiFlex silicone coating and underlying braid fiberglass is flexible, allowing for easy placement on curved lines and for installations requiring high flexibility and motion. The LoFlex is a stiffer material, providing slightly more protection than the HiFlex product due to the silicone having a high durometer. The standard colour is red-oxide. For the HiFlex version, black is also available. Custom colors are also available. For both versions, a hook & loop is added to result in a firesleeve than can be easily installed on long hose or cable runs, or on hose and cables that cannot be detached from their installation. 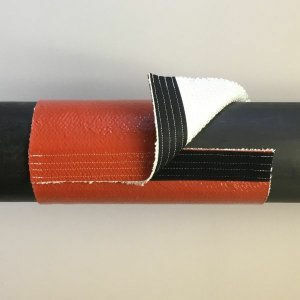 This retrofit solution allows the sleeve to be added, or replaced conveniently - this makes for an easy to use Electic Arc Furnace cable cover (EAF cable cover). The smallest standard I.D. is 1/2". For HiFlex version, 5" is the largest ID possible with a continuous material with no radial splices. For sizes larger than 5", lengths of firesleeve are overlaped and spliced together in order to reult in the larger ID size when closed. Using this technique, IDs of almost limitless size are possible. For the LoFlex version, 12" ID is the largest size possible in a continuous non-spliced material piece. Larger IDs are possible by fabricating multiple fabric widths together, with an almost limitless ID size being the result.